My father was a highly reputable business magnate-(a cocoa merchant)who operated in the capital of Ivory Coast during his days It is sad to say that he passed away mysteriously in France during one of his business trips abroad 22 August 2006.Though his sudden death was linked or rather suspected to have been masterminded by an uncle of his who travelled with him at that time.But God knows the truth! He also said he used my name to Deposit the fund with the bank as his only daughter, as well as the next of kin to the fund. He also explained to me that it was because of this wealth that he was poisoned by his business assocaites, That I should seek for a foreign partner in a country of my choice where I will transfer this money to and use it for investment purposes. I want you to assist me in clearing this fund into your account overseas as a beneficiary of the fund,and also use it for an investment purpose. I am just 25 years old and a high school leaving certificate holder and really don' t know what to do.Now I want an account overseas where I can transfer this funds. This is because I have suffered a lot of set backs as a result of incessant political crisis here in Ivory coast.The death of my father actually brought sorrow to my life. Please,Consider this and get back to me as soon as possible, as well I will like you to forward your private fax number if you are willing to have the relevant documents to confirm the existence of the fund for verification from the bank and to confirm the authenticity of my proposal to you also for easy communication. Above all I' m corresponding with you from my country here in Cote D' Ivoire West Africa and moreso there is great political crisis going on here in my country, that is the main reason why I contacted you to help me in getting me and my only inheritance out of this country so that I may not loosed my life and the inheritance to the crisis in this country, infact I' m facing hard difficulty at the moment in this country,Thank you so mch. Thank you immensely for your encouraging message which I recieved with happiness. Since the sudden and painful death of my father, life had been very difficult and traumatic for me. The civil war that broke out here worsened matters for me with life full of fear and uncertainties. What I really need from you is to be sincere and honest with me in this matter because the said fund in the bank is the only hope of my survival in this world and I' m not intend to play with it as it' s represent my life and furthermore I can assured you that this transaction is 100% safe and risk free it will also benefit both of us at the end only if we understand ourselves and work with one mind.I am now in love with you and I' m prepared to accept you for what you are I also look forward to our transferring of this fund to your nominated account so that I can come over there to be with you forever and express my deep love for you. I have never disclosed this transaction to any one except you that I' m now disclosing it to, Because my late father have seriously warned me before his death never to involve any person of my country origin in this transaction because of the circumstances surrounding his untimely death that I should look for a trust worthy foreign national who will invest this fund in a lucrative venture for me for my bright future sake as I no nothing about business or investment, never have handle any international related transaction like this before and I should follow expertise advise of whoever I may choosed to confide the fund to his or her care. 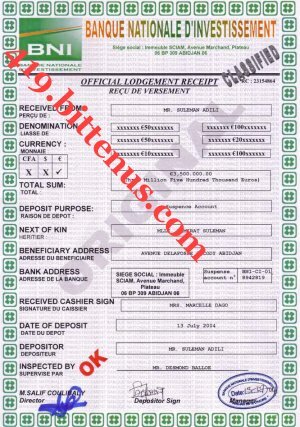 Dear, this transaction is therefore very confidential between us like I have earlier informed you and all the process involve will be legally transparent. Since the sudden death of my beloved father, life have been so traumatised to me as my late parents relatives are threaten to kill me after they have sold and shared my late parent properties left behind for me unjustly among theirselves and forcefully ejected me out of my late parents country home after it has been sold to a Lebanese businessman who based in san pedro state of cote d ivoire I have been hiding in a little house here in Abidjan as I had to leave our family house with everything inside except my late father' s important documents giving to me that covering the existence of the said fund for fear of his killers who may be after me. .Be rest assured that any amount you may incured in this transaction shall be reambursed to you first immediately after this transaction even with interest and to cover anywhere you may be taking the money from for I know that you are not helping me for nothing sake, To be frankly your promising to help me with all your resources overrides monetary efforts this have shown to me that you are not helping me because I had money nor because of the gratification that I promised to offer you after the transaction. It is very important and neccesary that you do not disclose anything concerning this matter to anyone in your country even your relatives as I will like this matter to remain confidential between me and you until we will succeed in transfering the fund out of this country. I hope on you and I beleive that you will accord this transaction with every respect and confidentiality it may deserves as you know that where money involved at times people can be funny.I intend to go to a good university under your care and guidiance immediately this fund is transferred into your would-be nominated bank account. I wish to study pharmacy. This is what matters to me most now as my education was disrupted by the untimely death of my dad. I shall therefore entrust this fund which represents my life into your care while I continue my education because this was one of the outstanding instruction that my late father gave to me before his death that I should further my education till I will attain successful height for my bright future sake. The greatest thing I need from you is trust and I am very satisfied with your sincere readiness to help me out of my unfortunate situation. My dear such encouraging words of yours have really strenghtened the trust and confidence I have in you and I hope you will not betray this trust that I have to entrust my only inheritance to the care of you. Thank you for the phone number I would really be glad to speak with you as this will no doubt reinforce our trust and understanding in each, other, you all the relevant documents that covering the existence of the fund in the Bank at any time you may request for it. Darling, I also need your identity by way of your national identity card or driver' s licence. It is not that I do not trust you. Honestly speaking I do. This fund is the only legacy my late father left behind for me. You can agree with me that in a transaction of this nature and magnitude, it is important that I know whom I am transferring such huge sum of money to since we do not know each other in person before.. This will no doubt reinforce our trust and understanding in each other. Upon getting all the informations I need from you, I shall forward to you the bank contact so that you may contact them to verify the existence of the said fund in their abode and also to know their bank requirements to transfer the fund out of this country to your would-be nominated bank account in your country. Thank you once more for your willingness to assist a distressed orphan like me. From your feeling and concern for my unfortunate situation, and your readiness to help me, you come to me like a kind and God-fearing person and I now have total trust and confidence in you that my money will be safe in your care. Above all be rest assured that every process involved in the transfer of this fund will be very transparent and legal as I am in possession of all the documents covering the fund. Darling, please we have to endeavour to finalise this transaction as soon as possible because of the volatile and coming of election situation here as the continued stay of this fund and myself here is giving me sleepless nights. Thank you so much for the love you have shown to assist me. I would really want to come over to live beside a love one like you immediately this fund is transferred to your nominated bank account to be under your care and guidance forever. Thank you for your readiness to help me in this direction. I really thank God for directing me to a caring person like you. Have a very pleasant day and may God bless you abundantly.. I shall at all times be putting you in my prayers for you are someone very special in my life now. I love you so much and I' m waiting to hear from you. this let me understand that you really care about me and you really want to help me out of this transaction,i believe that my fund will be safe in your care after the fund is transfer into your account. sweetheart i have discussed with the bank manager this morning and the bank manager let me understand that there' s no problem they can transfer the whole fund to your account. Kindly contact the bank and tell them that you are my guardian and family trustee manager and that you want them to transfer the whole fund to your bank Account without any delay,ask the bank manager the formalities to transfer the fund to your bank account. But the bank manager Mr Ballo Moumouny who is incharge of the fund in the bank where the fund is deposited in told me that if we want to make the fund transfer to your Bank Account you will need to contact him by yourself as beneficiary of the fund, now i have told him that you will be contact him regarding the transfer of the fund and he also told me that immediately you contact him for the process of transfer the fund then he will let us know the procedure how the fund will be transfer to your bank account. Now i will like you to contact the bank manager and ask him how the fund will be transfer to your account urgent and get back to me after you contact him so that i can know your discussion with the bank manager,dear let him understand that you' re contacting him on behalf of Miss Semirat Adili Suleman so that he can recognize you that you' re directed by me,you can call him on phone and send mail to him after you speak with him on phone. My dear i will like you to contact the bank manager and discuss with him how the fund will be transfer to your account soon, so that i can prepare myself to come over there after the fund is transfer to your account,i decided to scan and send you this document for the safety and security purpose of this transaction and i believe that you will keep it confidential as this transacation will be confidentially between me and you as i won' t like you to disclose it to anyone even your relatives as you know that people can be funny at times when money involve. I will be waiting for your mail after contact the bank manager,thank you so much for your love and your helping me i will be always remember you in my prayer for your assistance over this transfering of the fund.